Having been raised Southern Baptist in the 1980’s, I’m not sure that I heard the word Lent before I was a Religion major in college. Since learning of the liturgical calendar, I have been fascinated with this way of faith that gives a structure to the year and an intention to my worship. This is part of the reason that I jumped at the chance to preview Jennifer Spencer’s work Forty Names of Jesus: A Lenten Devotional for Families. The other reason is that, in the years that I have known Jennifer, I have learned that she is a learner, a teacher, a mother, and a friend who is naturally curious and desires to do life with excellence. A curious teacher writing a Lenten devotional was something I simply could not pass up. In the preface, Jennifer shares her inspiration for researching and writing this book; she had a need for something to teach her children about Jesus and couldn’t find material to meet that need in the particular manner she desired. That desire to help her children move from knowing stories about Jesus to actually getting to know Him intimately resonated with me as a new mom. As I read, I more and more appreciated her work as a teacher as well. While there are many strengths to this devotional, the following aspects make Forty Names particularly useful to me as a mother and an educator. First, the devotional is adaptable. Jennifer does a fantastic job helping the reader understand the different tools she intentionally provided. While the actual reading for each day is relatively short, she provides multiple ways to adjust the breadth and depth of the study so that it is age appropriate for each member of a family. With a key verse and concept for each name as well as additional passages of study, I can use this to introduce my toddlers to the names of God but can also use it with my small group of high school freshmen without having to do much prep work on my own. Second, the devotional is educational. The word devotional tends to have the connotation of fluffy or feel good, and there is a time and place for warm fuzzy devotional books. What is so appealing in this particular devotion is that Jennifer finds a way to warm the heart through engaging the mind. Moving seamlessly from Hebrew to Greek and Old Testament to New, Forty Names digs just a little deeper by providing historical and literary information that helps the reader understand and appreciate each name just a little more than you did before you started. Third, the devotional is theological. A vital part of teaching children about our faith is helping them see the common themes throughout Scripture that point the reader to Christ. This particular work falls in line with recent works for children such as The Jesus Storybook Bible, which declares the precious truth that “Every story whispers His name.” In terms that even young children can understand, Jennifer teaches about concepts such as redemption, sacrifice, and propitiation, and uses familiar Bible stories to illustrate the meanings. Fourth, the devotional is readable. It is possible to teach deep theological truths in layman’s terms. With simple definitions and a multitude of cross references that will help the reader increase familiarity with the full counsel of Scripture, there is an attractiveness to this work that draws the reader in and invites you to stick with the book, to come back for the next reading. A good teacher leaves a hook for her students so that they begin to internalize their motivation to keep learning, and the daily entries in this devotional are specifically written to guide the reader to the conclusion that she should just keep reading. With all that has been written in recent years about the exodus of youth from the church and the biblical illiteracy of professing believers, devotional works like this one show us that learning about Jesus does not have to be either loud and flashy or dry and boring; learning about Jesus can be simple and satisfying. Learning can be fun, and it can be genuine, and it can be done alone or in groups. We can even learn as families. An ideal plan for families with kids spread across developmental stages is to simply start small (one verse and the concept) and then just allow the conversation to continue by using the additional passages and questions as your guide. You may be surprised just how long even the youngest in your family may stick around to talk and learn. This is a devotional that can be added to your family’s permanent library because Jennifer wrote it in a manner that will allow you to also use it year after year and build upon what you’ve studied in previous readings. I am thankful that it is a resource that I have for years to come. If you are looking for a guide for your family for this upcoming season of Lent, I highly recommend Forty Names of Jesus. I care deeply for a very diverse group of people. They are teachers, doctors, lawyers, sales reps, caregivers, homemakers, service professionals, counselors, artists, pastors, pastors’ wives; heterosexuals, homosexuals, transsexuals, former homosexuals, still-haven’t-figured-it-out-sexuals; agnostics, Jews, Muslims, Catholics, liberal theologians, Reformed theologians; Republicans, Democrats, Libertarians, and a few who have never voted; former child molesters and abusers, and those who are healing from the effects of molestation and abuse; drug addicts, and those who, by the world’s standards, have never made a wrong decision in their lives. One of the reasons that I love them all is one common trait they all possess: loving respect for all of humanity, even those who are very different from them. The last few months have seen some of the people who I love dearly caricatured and stereotyped, then brutally attacked with both the written and spoken word, either directly and individually, or because of a particular group with whom they identify. And in case you missed it, sticks and stones may break your bones, but words can permanently damage. You see, friends, there is a more excellent way than the way humanity is treating one another in this season of time. We have drawn sides, demonized all who disagree with us, and agree only on the fact that all issues fall under a “Take No Prisoners” rule of engagement. So Christians attack Muslims. And vice versa. And heterosexuals attack homosexuals. And vice versa. Republicans attack Democrats. And vice versa. Creationists attack Evolutionists. And vice versa. But there is a more excellent way, shared with us by the Apostle Paul. Regardless of how you may feel about the Bible, or about Paul, or his theology, or his sexuality, or his missions strategy, we can all agree that his way is, indeed, more excellent. 27 Now you are the body of Christ, and each one of you is a part of it… 31 Now eagerly desire the greater gifts. And yet I will show you the most excellent way. 1 If I speak in the tongues[fn] of men or of angels, but do not have love, I am only a resounding gong or a clanging cymbal. 3 If I give all I possess to the poor and give over my body to hardship that I may boast,[fn] but do not have love, I gain nothing. Simply put, let’s grow up and love one another. This one will take a while to chew on. But it is glorious! See the Temple and how there is a better than the best. I bought a book for my niece and nephew for Christmas this year. Nothing shocking about this; I was buying them books before they were born. But this year I picked up what is, I believe, the most well written, theologically rich storybook Bible I’ve ever seen. The Jesus Storybook Bible by Sally Lloyd-Jones and illustrated by Jago is an exceptional storybook for both children and adults. The reason for this is that, unlike most storybook bibles that read like a collection of disjointed short stories, this storybook Bible reads like a chapter book. It is designed to teach the grand narrative of Jesus to even the youngest listener. Each story refers to previous ones and, more importantly, points to the future plan of God. The following excerpt is from the account of Noah and the flood. It is one of my favorites so far because it shows both the quality of writing and the depth of the theology. The first thing Noah did was to thank God for rescuing them, just as he had promised. And there, in the clouds– where the storm meets the sun– was a beautiful bow made of light. God’s strong anger against hate and sadness and death would come down once more– but not on his people, or his world. No, God’s war bow was not pointing down at his people. It was point up, into the heart of Heaven. Beautiful word pictures and well crafted foreshadowing make this a story pleasing to both the heart and the head. While the book itself is excellent, the Deluxe Edition is even better. Included is a 3-CD set of audio CDs with the entire storybook narrated by British actor David Suchet. The words come to life listening to him! We’ve spent the evening listening and following along and it has kept the attention of a 22 month old, a 21 year old and a 32 year old. Multi-generational to be sure. 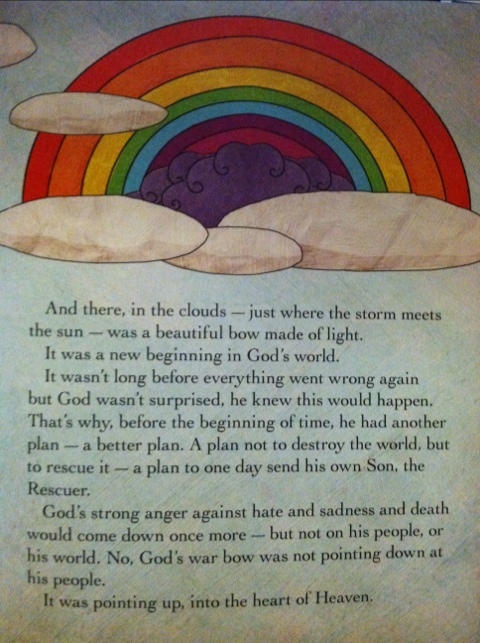 What this storybook proves is that the story of Jesus does not have to be “dumbed down” for children. And adults don’t have to feel silly enjoying a children’s book. The Jesus Storybook Bible is a good children’s story. The Bible is not about you. Dr. Akin gave this to us this morning in class in a discussion of typology in the Old Testament. His point was to show that while so much of what goes on in the church today is people-centered, self-help, feelings-healing, needs-meeting fluff, the Bible is not really about us, it’s all about Jesus. When we focus on ourselves, we so often miss the point that when we really meet Jesus, we find our help, our feelings are healed and our needs are met! Too often when we study scripture, we start with the wrong question: “What does this say to/about me?” If we start our study asking, “What does this tell me about God?” then we really get down to the deep riches of the Word. After all, if we are called to conform to the image of Christ, shouldn’t we be learning more about him and less about us? Jesus is the true and better Abel, who, though innocently slain, has blood that now cries out, not for our condemnation, but for our acquittal. Jesus is the true and better Abraham, who answered the call of God to leave the comfortable and familiar and go out into the void, not know wither he went to create a new people of God. Jesus is the true and better Jacob, who wrestled and took the blow of justice we deserved so we, like Jacob, only receive the wounds of grace to wake us up and discipline us. Jesus is the true and better Joseph, who, at the right hand of the king, forgives those who betrayed and sold him and uses his new power to save them. Jesus is the true and better Moses, who stands in the gap between people and the Lord and who mediates a new covenant. Jesus is the true and better Rock of Moses, who, struck with the rod of God’s justice, now gives us water in the desert. Jesus is the true and better Esther, who didn’t just risk leaving an earthly palace, but lost the ultimate and heavenly one, who didn’t just risk his life, but gave up his life to save his people. Jesus is the true and better Jonah, who was cast out into the storm so that we could be brought in. Jesus is the read Rock of Moses, the real Passover Lamb, innocent, perfect, helpless, slain so the angel of death will pass over us. He’s the True Temple, the True Prophet, the True Priest, the True King, the True Sacrifice, the True Lamb, the True Light, the True Bread. The Bible’s not really about you—it’s about Him.